My family knows the way to my heart is through…coffee! 🙂 Specifically lattes with a little sugar and cream. I was thinking of some Valentine treats to make (and of course I was also thinking about coffee) and thought these “I Love You A Latte Valentine Rice Krispies Treats” would be so cute! I love the way they turned out and they would be perfect to give away as Valentine treats for a party or just because. 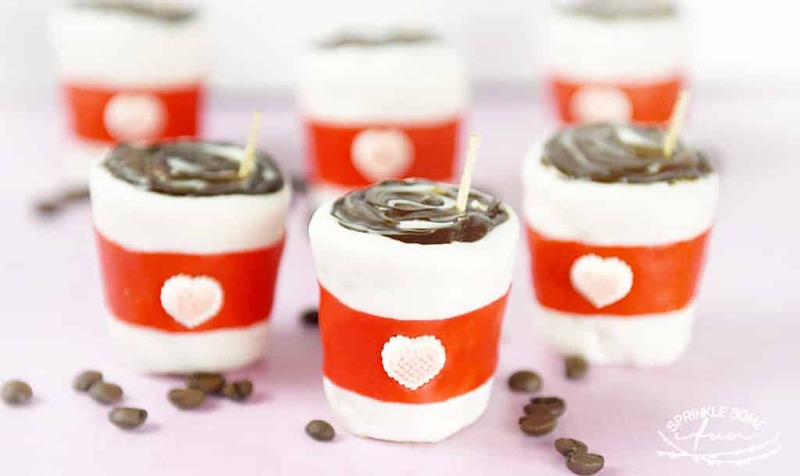 These are so easy to make with a little trick! I used mini plastic cups to mold the Rice Krispie Treats in (store bought Rice Krispie Treats worked best). I just pressed them inside the cups and rolled out some fondant to use for the outside. Then I had my daughter help me wrapping fruit by the foot around the middle and we added a little candy heart to that. Then we spread some chocolate to the top and swirled white chocolate inside that when it was still wet. Lastly we added a little toothpick in the top to look like a stir stick! So cute! My kids loved helping out with these and they want to make them for all their friends now! So fun and super cute!! !